Whether you live in a modern home or period property, the front door you choose can often reveal a lot about your personality and taste. It should be a focal point. It should create a positive first impression. It should warmly welcome visitors into your home. Exterior design trends continually evolve, but composite and uPVC doors continue to be the two most popular materials for style-conscious homeowners. But when it comes to composite doors vs UPVC, it can be more than a little confusing! So, how exactly are they different? And which is the right one for your home? What is a composite door made of? 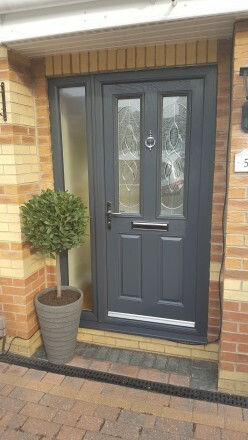 Composite doors (pictured above) are made from a number of different materials – and usually feature a steel frame with a timber core and insulated foam layer which is glued together and encased in Glass Reinforced Plastic (GRP). Manufactured under high-pressure conditions, the end result is an incredibly strong and secure door that’s resistant to all weathers. What is a UPVC door made of? 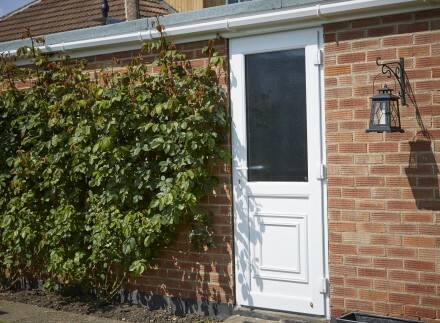 UPVC doors (pictured above) are made by encasing an insulated steel frame in un-plasticized polyvinyl chloride (UPVC) to create a sealed unit which is strong and thermally-efficient. 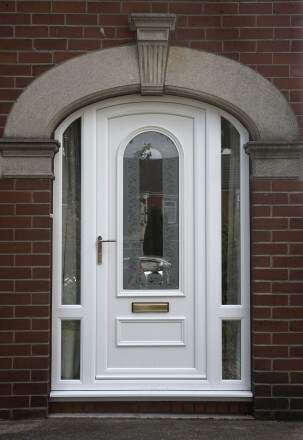 UPVC doors do have a plasticky finish, but they’re an affordable and effective solution to stylishly secure any home. 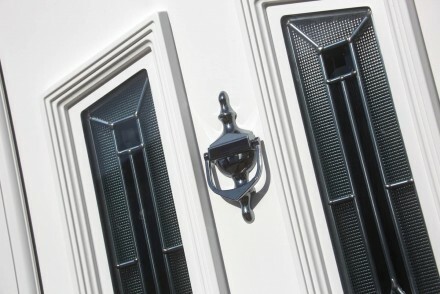 What’s the price difference between UPVC and composite doors? Make no mistake, composite doors are more expensive than a like-for-like UPVC equivalent – often by as much as 60 per cent. However, this is because they’re manufactured in a more sophisticated way, using materials and techniques which are costlier. Although the initial outlay is more for a composite door vs UPVC, both styles offer excellent value for money, especially in terms of energy savings, and both will make your home less risk from being burgled. Just because they’re a little bit cheaper to make, don’t be fooled into thinking that UPVC doors (above) are not secure. They are – thanks to their super-strong outer frame and multi-point locks, which combine to create an extremely strong entrance door. However, because of their glass-reinforced plastic core, a composite door does offer slightly higher levels of security. In reality, though, it would take a very determined burglar to gain entry by breaking through either one of these doors. Due to the way a high-quality composite door is manufactured, they are usually much thicker than uPVC doors. 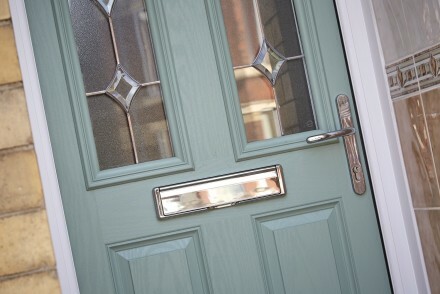 At EYG, our composite doors are 44mm in thickness compared to our UPVC doors at 28mm. Whilst this gives the composite style a more robust feel, both door types are extremely strong and resilient with great insulating qualities. If we’re honest, there’s nothing between composite and UPVC doors when it comes to looking after them. Simply wipe the door and frame down with a damp cloth once in a while to keeping it looking its best. Lifespan wise, you should expect a composite door (pictured above) to last around 30 years - if it’s looked after properly. For UPVC doors, the life expectancy is slightly less at 20 to 25 years, but this also depends on how well you take care of it. There’s no getting away from the fact that UPVC doors (pictured above) have a slightly plastic-sheen finish to them, whilst composite doors exude an authentic timber appearance. Colour wise, UPVC doors are available in slightly fewer shades than composite doors – but the number of RAL colours you can choose is still extensive. No matter which material you prefer, you can also have a different colour on the inside and outside. In terms of door furniture, there’s no difference – simply select the handle, letterbox and knocker which is best suited to your home and taste. You can also choose from a wide range of beautiful glass options. How do they compare for thermal efficiency? 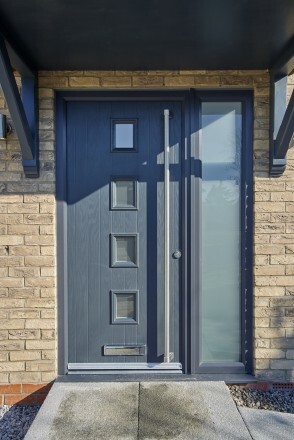 In terms of energy efficiency, a composite door (above) will usually perform slightly better than a UPVC door because of the extra thickness and density it boasts. However, both doors will reduce the amount you spend on heating your home by preventing draughts from finding their way in. At EYG, our composite doors feature brush seals and weather-proof gaskets to shut out all weathers, keeping you warm and dry. When deciding which door material is right for your home, it’s important to weigh up all the different factors. The reality is that both UPVC and composite doors are low-maintenance options, which are well insulated and make it almost impossible for burglars to break-in through. UPVC doors: Significantly lower priced than a composite alternative, and thinner in appearance, they offer a stylish, but affordable finish for any home. Composite doors: Virtually indistinguishable from timber, they boast the same functionality as UPVC but to a slightly higher standard. As a result, they are more expensive, so consider whether their advantages outweigh the extra cost. As with every significant home improvement, choosing a new door requires a lot of thought and consideration. Price will always play an important part in the final decision, but so should your personal preference. If your home requires a new back door or garage entrance door, where function matters more than the final finish, the better option may be UPVC (as shown above). If you really do prefer the look of composite, but the extra initial outlay is putting you off a purchase, it may be worth waiting to save up enough money to get the door you actually want. Or you could help to spread the cost with a ‘Buy now, pay later’ flexible repayment plan from EYG. Thankfully, no matter which material you choose, you won’t have to compromise on function over style – as both will transform and modernise the look of any home.